Intriguing rock formation, and breathtaking natural landscape, Grand Junction is a year-round destination with something for everyone. Ranging from the Rocky Mountains to the rolling hills, high desert and rivers, there are diverse natural as well as man-made attractions to explore in this city. A great city to soak in the tranquility and the scenic mountain beauty, the city offers a lot of outdoor activities such as hiking, biking, rafting, fishing and camping to outdoor enthusiasts. Explore the Colorado National Monument’s red rock and Grand Mesa National Forest or soak up a bit of culture at Avalon Theatre and the Museum of the West. As a top travel destination, Grand Junction has an extensive selection of hotels for every need and budget. Whether cheap motels in Grand Junction or Grand Junction luxury hotels, you will find everything. 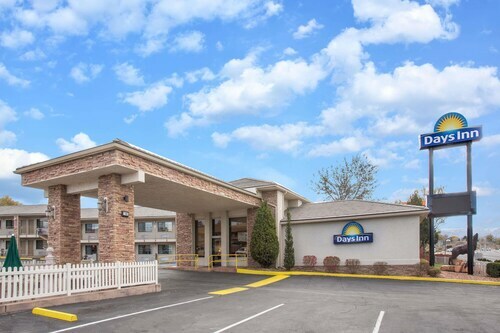 Getting the best available Grand Junction hotel deals can be quite tricky and we at MyFlightSearch have partnered with top domestic as well as international hotel chains, so you always get the best hotels in Grand Junction available online. Browse our selection of cheap hotels in Grand Junction Co and save big on your trip! Grand Junction enjoys a soothing climate almost throughout the year. However, autumn (September and October) and spring (March and April) is the best time to visit the city when the climate remains pleasant. Summer months (May to August) are also an excellent season to visit the city. However, summer months remain packed with tourists and hotels in Grand Junction CO can be costlier. The shoulder months of Spring (March and April) and Autumn (September and October) are the best months to visit the city to save a significant amount of money as visitors can get incredible deals on best hotels in Grand Junction. Apart from the opportunities to get cheap Grand Junction hotels, visitors get to enjoy various outdoor activities as well as the scenic beauty of forest changing to fall hues. A trip to the Colorado national monument should be high on the itinerary as the panoramic view of the soaring red rock structures are bound to keep anyone mesmerized. This is also the best place for outdoor lovers to enjoy camping, hiking, rafting and mountain biking. With a wealth of fancy restaurants, art galleries, shops, theaters, live music and festivals, downtown Grand Junction, offers something for everyone. Spend the day shopping, treating you with some delectable food and exploring the city’s vibrant arts and culture at a local museum or gallery. Visit in April to participate and enjoy Fruita Fat Tire Festival, one of the most famous festivals in the city. This festival brings together biking enthusiasts from all over the world which features world-class biking race. This is where the largest companies in the biking industry exhibit their services and products. Known as one of the largest flattop mountain in the world, Grand Mesa is one of the most iconic attractions in Grand Junction. Covering hundreds of square miles, the Mesa scenic highway meanders through 63 miles of national forest, lakes and wildlife. The park is a famous destination for outdoor lovers as it offers fishing, camping, hiking and much more in abundance. Powderhorn mountain resort located in Grand Mesa is a popular winter destination which provides some of the best skiing and snowboarding in Colorado. Home to largest concentration of vineyards and wineries, Grand Junction’s Wine country is one of the most exciting places to visit while in the city. Wine Country houses a dozen of wineries and visiting these wineries is much more than tasting the wine. Fall in love with the natural beauty of the grand valley which is surrounded by the red rock cliffs and explore the picturesque vineyards and orchards in a horse-drawn wagon. Savor some of the finest wines such as merlot, chardonnay, cabernet sauvignon, shiraz and several German-inspired wines with delectable snacks. Visit these wineries during one of the annual fests such as Spring Barrel Tasting and Colorado Mountain wine fest to make your visit more exhilarating. A visit to the iconic Colorado national monument is a must while on a trip to Grand Junction. The scenic beauty of the soaring red rock structures and the outdoor activities are sure to keep anyone enthralled. One of the best rock climbing destinations in the world, this is also an amazing place for camping, hiking, rafting and mountain biking. Home to numerous shops, music venues, restaurants and galleries, Downtown Grand Junction, is one of the most prominent landmarks in Grand Junction, located in the heart of the Grand Valley. A hub of various sporting events, picnics and kid-friendly attractions, canyon View Park is a major landmark in the city. Colorado Mesa University, located in central Grand Junction is one of the most popular landmarks along with other nearby campuses. The towering monolith is the most iconic landmark as well as the attraction in Grand Junction which is well connected to other areas. One of the most popular wineries, producing a fantastic array of fine wines, St. Kathryn Cellars Winery is a major landmark of Grand Junction. Two Rivers Convention Center is the largest hub for meetings, seminars, reunions, weddings, receptions, banquets, concerts, galas and trade shows in the city. A perfect setting for all activities with picnic spots, ponds, trails, sports complex and various outdoor activities, the 110-acre recreation space called canyon view Park is a major landmark of Grand Junction. Nestled in the heart of Colorado’s Grand Valley, Downtown Grand Junction is a popular area for tourists and locals. Home to numerous shops, music venues, restaurants and galleries, Downtown Grand Junction, is also one of the best areas to live or book a hotel as this is an upscale neighborhood with all urban amenities. Average cost of a hotel room in Grand Junction? An average hotel room costs around $70 to $85 in Grand Junction. Which are the most popular Grand Junction neighborhoods to stay for Business Traveler? Downtown, Appleton and Orchard Mesa are the most popular areas to stay in for Business Traveler. How much do you tip a porter at a hotel in Grand Junction? $5-$10 depending on the type of service the porter will provide. Best Time to Book a Hotel in Grand Junction? Winter months of December and January are the best months to book Grand Junction hotels when one can get cheap hotels in Grand Junction Co.
Grand Junction Regional Airport is the main airport serving the city of Grand Junction which is served by six airlines to cities like Dallas/Fort Worth, Denver, Salt Lake City, Phoenix, and Las Vegas. The nearest international airport serving the city is Denver International Airport and it is served by all major airlines. 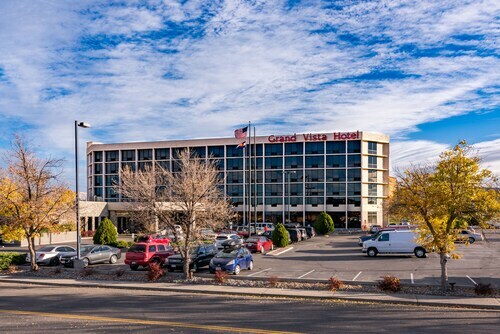 If you want to book Grand Junction airport hotels or Grand Junction resorts, there are a plenty of options to stay near the airport as well as other major areas.